SOTU-DB: 2 weeks from deadline: update! First, I got graphics to output to PNG files. It was easier than I expected. I think learning about PHP helped me understand the paradigm to write to files here. Now I have a script "simple-plotter.R" that will output a chart to "simpleplot.png." All I needed was png("nameOfFileToWrite") before the call to draw the chart (plotSentiment in this case, but it should work with any graphic). Then, dev.off() afterward stops the redirection, sending output back to stdout. 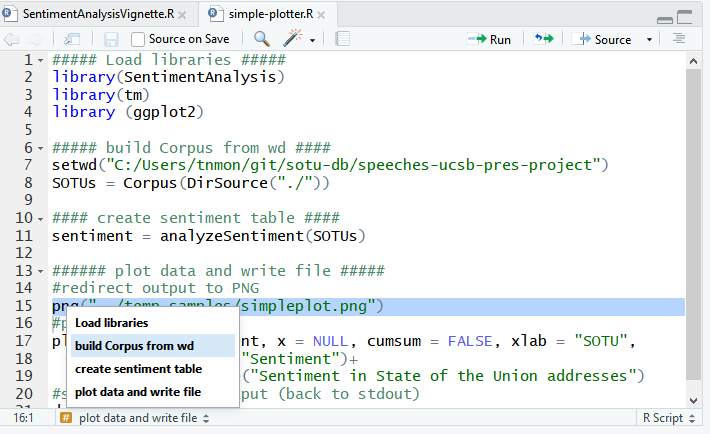 Also, I learned a handy thing about R Scripts: adding four or more pound-sign comment hashtag symbol things (####) after a line sets it as an anchor that you can jump to within the RStudio editor. This is definitely helpful as one of my recent issues has been just getting lost within the R scripts. R still takes me more time and effort to read than, say, HTML or Java, so it's nice to find these little tricks. I also learned about two R packages for sentiment analysis, sentimentr and SentimentAnalysis. I've just barely begun checking them out but actually you can see the loading of SentimentAnalysis and then the calling of its analyzeSentiment() function in the screenshot above. I'm not sure it adds much new to the toolbox, but it does seem to simplify some tasks (and if nothing else it adds more sentiment lexicons). I'll be checking into these more in the coming days, but it's nice to go from a bunch of text files in a directory to a line chart like the one below in three commands. Aside from all that, I've added a bundle of SOTUs (including Carter's obnoxious separate written/verbal ones), begun cataloging my R script files, and re-wrote the requirements inside the GitHub repo.